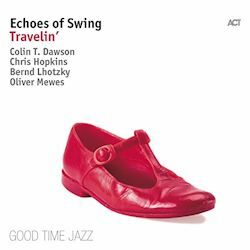 Echoes of Swing have been releasing a delectable series of discs of late. Dancing, Blue Pepper and A Tribute to Bix Beiderbecke have all shown the stylistic versatility of this classy chamber foursome, a two-man front-line supported by piano and drums in emulation of Big Fours throughout jazz history. There’s a geographical theme at work, programmatically speaking, and originals snuggle up attractively to established classics of the canon in a way that allows the fifteen tracks to cohere very nicely indeed. There’s not a dud to be heard here. Orient Express gets the disc underway, a locomotive tone poem complete with jump style solos and arrangement, with composer Chris Hopkins wailing Hodges or Willie Smith-style over the pulsing, galvanizing rhythms. It’s a risk to disinter Volare but with Bernd Lhotzky’s Teddy Wilsonesque piano runs and some shuffle percussion from Oliver Mewes, things are in the safest of Good Time hands. Brass man Colin T Dawson sings pleasantly on Nat Adderley’s The Old Country and Hopkins, American-born but a German resident since childhood, rips into the Pete Brown alto hymn sheet for a blistering contribution (Hopkins is also a top-class pianist but leaves these duties to Lhotzky). Dawson plays with rich-toned Braff-like warmth on Hopkins’s wackily titled On a Slow Goat Through China (the goat was probably less comfortable than the boat) and there’s real joie de vivre in the chases between alto and muted trumpet on Das Wrack der Guten Hoffnung where Dawson’s wa-wa mute work is splendid. This really is one of those biggest little bands in the land, generating real heat to sound far bigger than a four piece. Dawson plays eloquent flugelhorn on the Ellington-Lawrence Brown ballad On a Turquoise Cloud and there’s a nice contrapuntal start to Vernon Duke’s Cabin in the Sky. Indeed, there are felicities – in soloing, in arrangements – throughout the album, not least Lhotzky’s Stride piano on Gan Hyem, the Jungle trumpet so evocative of the Cotton Club in Bechet’s Southern Sunset and the jazzing of Schubert’s Wohin? courtesy of Lhotzky. Splendidly recorded, stylishly and passionately performed, this is another winner from a group that both honours the past and brings it vividly to life.